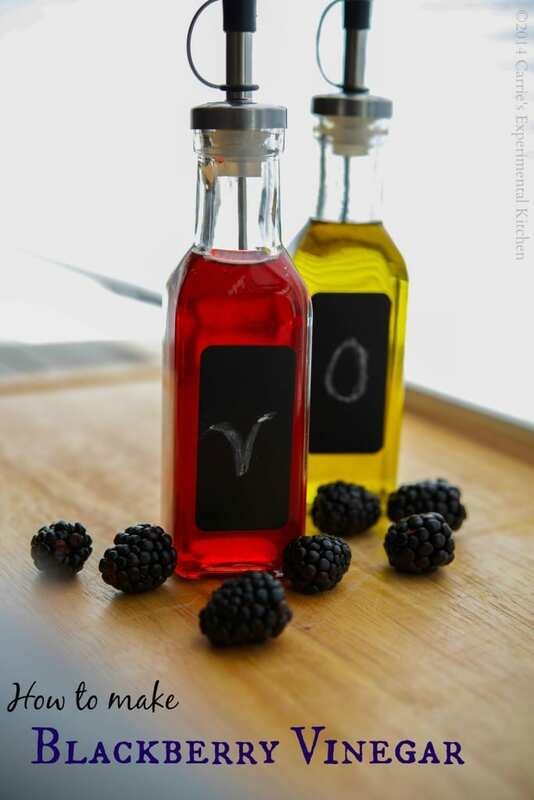 Making your own fruit flavored vinegar, like this blackberry version, is easy and only requires a few simple ingredients. There are so many flavor combinations to choose from. Sometimes I never know what my next experiment is going to be until I find something unexpectedly. For example, our cheerleading team was hosting a garage sale fundraiser several months ago and I found four, white porcelain ramekins for $1. Not each, but all four for one dollar..BONUS! As soon as I saw them I KNEW I was going to make some kind of macaroni and cheese dish and that’s when I created the recipe for Rosemary & Goat Cheese Mac n’ Cheese. Perfect right? Well this is the exact same way this recipe for Blackberry Vinegar was created. I was walking through Target one day and I like to look through those few isles where they have everything for $1. These cruets caught my eye and I loved how they had a chalkboard front. Since Spring is just around the corner, I thought making some homemade vinegar would be a great idea to post about to get us all out of this winter doldrum. Making your own vinegar is SUPER EASY, it’s the waiting that’s a killer! Two ingredients: vinegar and fruit of your choice are all you need. My local market has had an abundance of blackberries lately so I chose to use those, but feel free to experiment and substitute as you wish. Once you make the vinegar, you can use it as the base for a salad dressing; to marinate meat, poultry or fish; or toss it in with your favorite pasta salad recipe. Don’t they sound good? I can’t wait for salad season! ~Enjoy! 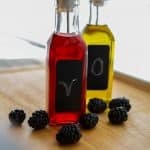 Making your own fruit flavored vinegar, like this blackberry version, is easy and only requires a few simple ingredients. 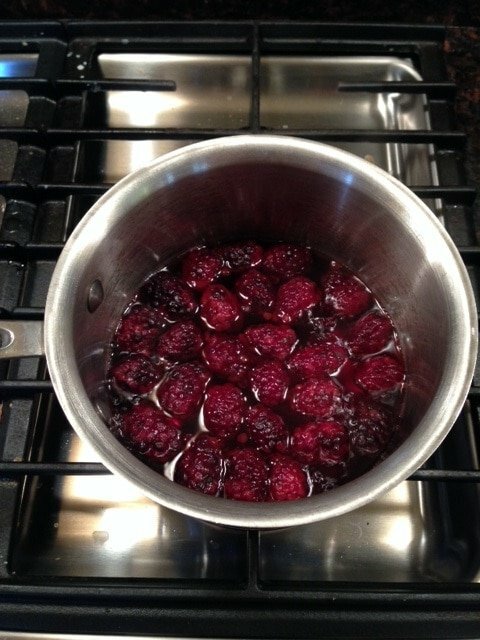 Add the vinegar and blackberries to a small, stainless steel saucepan and bring to a boil over high heat; then reduce heat to low and allow to simmer for 5 minutes. Remove from the heat and allow to completely cool; approximately 30 minutes. Place the vinegar in a covered, airtight container and allow to sit at room temperature for 2 weeks. Sterilize your storage bottle by placing it in a saucepan filled with water. Allow it to come to a boil and simmer for 3 minutes; then remove and allow to dry. Strain the vinegar in a fine mesh strainer or cheese cloth so that it catches any sediment. 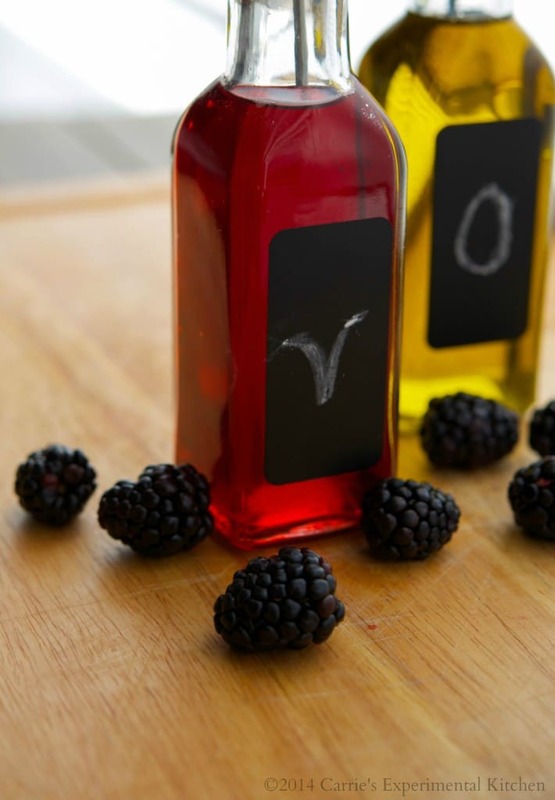 Discard the blackberries and store in your sterilized bottle. Thanks for the recipe! I have two questions-if I don’t have a stainless steel pan, can I use a clap halon pan? Also, does the vinegar go bad after 6 months? Hi Cindy and so sorry for the delay in response. Yes, you can use another type of pan and the vinegar should be fine if stored in a cool dry place and is sealed well. Hello. I am about to make your blackberry vinegar. Any new advice or perspective from you a year and a half later? I’m not good on measurements – is the ratio about 50/50? Thank you! Hi Patricia, yes it’s about 50/50 depending on how many blackberries come in a pint. Thanks for stopping by and I hope you like it! If you boil the vinegar, does it still have the “mother” and make real vinegar, or is this a BlackBerry-flavored vinegar? I’ll have to try that, thanks for the suggestion! Do you water bath the jars after you make the flavored vinegar?